Break out the fireworks and fire up the grill. It’s time to celebrate your independence with a 4th of July party. 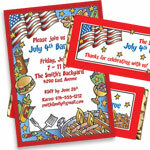 Our Independence Day party plans offer hundreds of free 4th of July party ideas. So let freedom ring! Fourth of July Theme Party - Uncle Sam Wants You! Give Your Patriotic Celebration the personal touch! 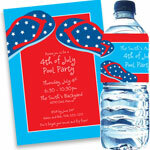 Personalized patriotic invitations are a wonderful way to set the mood for your party. And our matching designs for party favors and decorations will carry the theme throughout the night. Make shopping for your 4th of July party decorations and party supplies much easier! 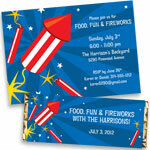 We recommend hundreds of fun Independence Day party supplies, decorations and party items. Your guests probably walked in with a hostess gift. So why not let them walk out with a great patriotic theme party favor? There’s candy, loot bags, personalized water bottles and…..well the list just goes on. We suggest favors that work with your party theme and your budget. We have lots of fun 4th of July party ideas that will keep your crowd happy and busy! Don't forget the universal bike parade where kids use crepe paper and the like to decorate their bikes to show off in the neighborhood. Another decorating contest that you can have for the kids is a "decorate your own placemat" contest. This adds to the overall decoration, as well as giving the kids something to do to keep them busy. Have your own baseball game! Divide guests into teams and play ball! Or you can have an entire Olympiad! The games don't have to be traditional ones either. You can have cookie eating contests and fun relay races or other crazy games. And yes we have more patriotic party games for your enjoyment.